This day last week we started up a three knives giveaway in three different social networks: Huntsman Knife | Forest DDPAT on Vkontakte, Huntsman Knife | Scorched on Facebook and Gut Knife | Crimson Web on Twitter. 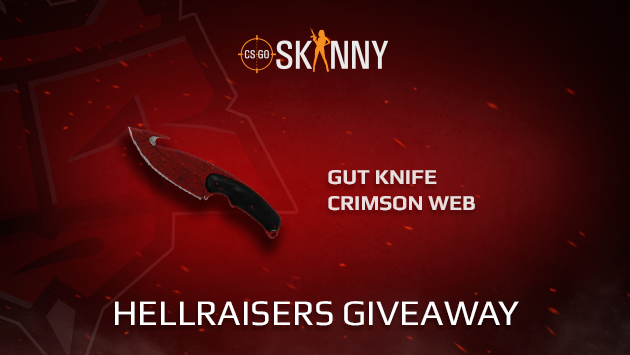 The main condition of the giveaway was to subcribe to all social networks of HellRaisers and our partners CSGOSkinny. Today we are ready to post the names of randomly chosen lucky men who very soon will get the sacred prizes! Igor Boo is a winner on Vkontake. To get your prize, get in touch with the HellRaisers representative. Alper Arıcan is a winner on Facebook. To get your prize, get in touch with the HellRaisers representative. Johan Borgvald is a winner on Twitter. To get your prize, send a private message on Twitter to the HellRaisers representative. Don't forget that if during 24 hours after the results announcement the winners will not get in contact with the HellRaisers representatives to get their prizes, winners will be rerolled. Follow our website and social networks to keep up-to-date and, of course, not to miss such giveaways!